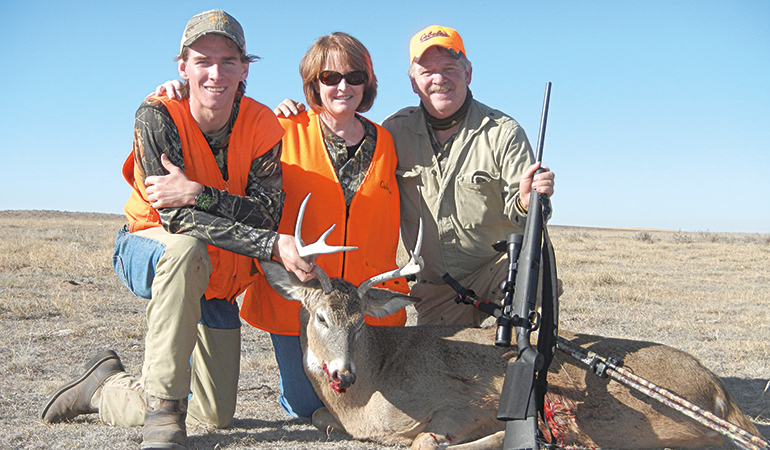 Joe and Cathy Arterburn with their son Sam's 2012 buck. Wind and Snow were blowing out of the northwest, as usual. We’d parked on the southeast corner of three contiguous sections ofrolling pasture, climbed over the barbed-wire fence, and walked in. Icy pellets stung our faces. The sun was cutting through, just enough to make you squint against the glare. On a day like this, I said to my son Sam, deer will be laying up just out of the wind on the lee side of a hill, catching warmth from the sun and watching downwind, counting on their noses to let them know if any danger comes from the upwind side. Unless they’re feeding ahead of this storm. In any case, we need to spot them before they see us. A half-mile and two hills down, we walked up a third hill like we had the other two: slowly, a step at a time, stopping to glass, dissectingthe scene as each step revealed more of the pasture panorama. We spotted tips of antlers, then another set, and then another, on the upper reaches of the south-facing slope of the next hill. We crouched and backtracked to plan a new approach. Sam looked at me with a curious expression that asked: How’d you know they’d be laying up there like that? That’s how I’d always done it, teaching Sam and his two older brothers, Hunter and Jack, by being in the field with them, pointing out bits and pieces of what I had learned by experience or by reading outdoor books and magazines. That got me to thinking about how it’s actually been a two-way process; how hunting with the boys, from their first does to first basket-racked bucks to some nice ones now hanging on the wall, has been like a continual refresher course, reminding me of fundamentals and making me revisit skills and knowledge and, in the process, making me a better deer hunter. Taking a curious youngster hunting is a learning experience for all involved. You sometimes forget the importance of the little things you take for granted until an inquisitive novice hunter asks questions. I took my three sons on hunts long before they were old enough to take hunter-education classes; call it hunter-ed kindergarten. They tagged along in blinds at young ages, jumping out to retrieve downed birds when the action was on and drinking hot chocolate when it wasn’t. 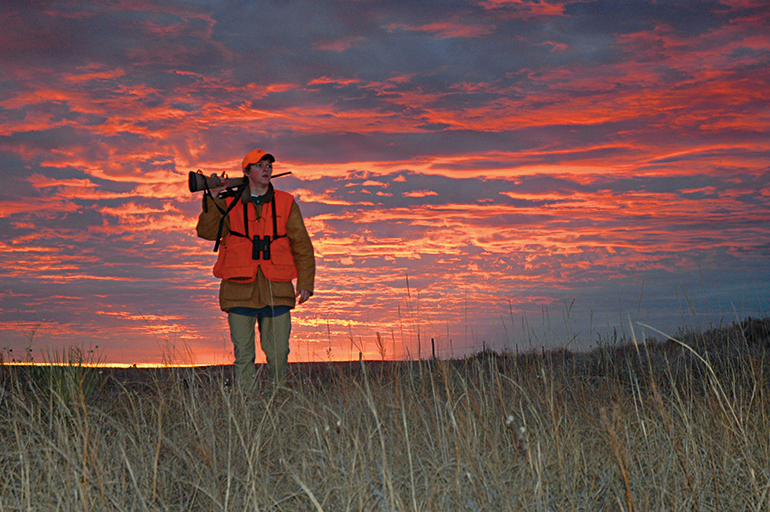 On deer hunts, they’d be at my heels or waiting in the pickup, watching through binoculars. It’s all a learning process but formal schooling —hunter-education classes—is a key component. Listening to hunting stories for years, I’ve heard from countless recent hunter-ed students about the value of what they learned. They almost always stress safety aspects and the overriding concept of ethical hunting. Hunter-ed classes lay the foundation, providing the fundamental building bricks—safety and ethics, yes, but also, among other things, firearm, bow, and crossbow handling; shooting and hunting skills; and what I consider vitally important: wildlife and wildlife behavior. In-the-field experience strengthens the hunter-ed foundation, adding bricks and refining that knowledge, which continues throughout a hunting lifetime. Nevertheless, I didn’t set out to be a mentor, just a parent introducing my children to something I enjoy. I taught the boys about animal tracks. Naturalist Ernest Thompson Seton (an early influence on me) wrote that from the moment an animal is born it begins to leave tracks, a trail that continues for the rest of its life. The boys quickly picked up on deer tracks, what they looked like, but it took fine-tuning to distinguish between bucks and does and even more so between so-so bucks and the heavy, wide prints of big bruisers. I pointed out others: coyote, turkey, rabbit, pheasant, cattle, the pronounced “thumb” on a possum track, the finger-like tracks of raccoon, human, and a lot of tracks from our dog. But it was the “What’s this?” moments that improved my tracking. “What’s this?” they’d ask. Instead of bluffing with a guess, I’d say, remember it and we’ll look it up in the track book at home. This was before cell phones. Now it’s easy to snap a photo and look it up later. 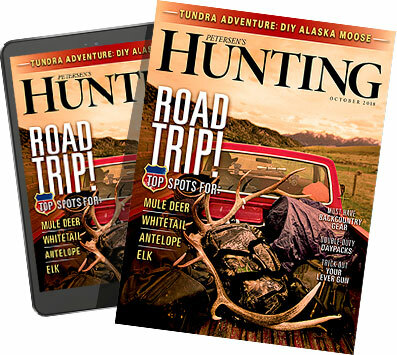 The importance of wind direction and scent control is easily taught—and remembered after a time or two of a whitetail huffing, stomping, and leaving an overanxious young hunter nothing to see but a retreating white tail. Hunt with the wind in your face, you explain. Or across your face, but in a crosswind, don’t have blinders on; be aware of what is downwind as well as in front of you. It’s my contention that people walking, even stalking, make more noise than they realize. Either that, or they are clueless of all the reasons you shouldn’t make unnecessary noise while hunting. Walking through pastures, I’d exaggerate sidestepping sagebrush and yucca to prevent a scratching sound across my pant legs. I’d elaborately tiptoe through and among twigs and brush, quietly moving aside branches rather than pushing past them. If their footsteps behind me seemed too loud, I’d stop, point to their feet, then move on. Don’t focus only on what you see; focus on what you hear, too. And I’d motion for them to follow me around the crown of the hill, so we didn’t pop right over the top, skylined for every critter in the pasture to see. I learned from tracking just how cagey whitetails can be. Early on, we were busted by a herd of about twelve deer, including a nice buck, which took off like a shot, up and over a hill. They’re long gone into the next pasture, we figured. We walked back to the pickup and headed parallel to the direction they’d run, then turned at the intersection that would bisect their escape route into the neighboring pasture. We’d cut their tracks on the sandy road, we figured, and come up with a game plan from there. We drove slowly, expecting to see a passel of tracks. Nothing. We turned around and looked closer. Nothing. Convinced they hadn’t crossed the road, we walked the quarter-mile to the hill over which they had escaped. We could see how the deer had run over the hill until they were out of sight, then veered to the south and out onto open country and safety. They weren’t going to leave their home area, but they sure made us believe they were. That’s an experience I stress to my boys. Don’t trust whitetails. They’ll light out like they’re leaving the county, but they’ll cut back, circle around—anything they can do to fool you. A successful shot can close the deal on a hunt, but not every successful hunt has to end with a shot. I’ve come home empty-handed numerous times with a feeling of satisfaction of time well spent. I’ve gotten a lot more shooting practice since I’ve been shooting with my kids, but we still don’t practice often enough. Teaching them to shoot, I was forced to concentrate on proper form and technique, since family competitiveness drives us to try to outshoot each other. The No. 1 rule of shooting is safety. The No. 2 rule of shooting is be good at it. There is great responsibility to pulling a trigger or releasing an arrow. Once you do, you’re responsible for the events you’ve set in motion, events that cannot be stopped, cannot be called back. You can’t push the reset button and start over. There is a finality to it. And you owe it to the game animals you hunt to be a good shot; to take only good, ethical shots within your range of experience and level of expertise; and to make clean, one-shot kills. The animal deserves your best effort, and you should work hard and practice to achieve it. You’re a hunter. You get it. Watch after the shot—not just the animal but everything in view. A good example was when a friend took a 200-yard-plus uphill shot at a deer from a good, steady rest, and from the deer’s reaction I knew it was hit. My friend had that excited but worried feeling, thinking he’d made a good shot but wasn’t sure. As he was talking, I was still watching. We’ll find him, I said. We made a beeline to where the deer stood at the shot. No deer was in sight. We’ll find him down in that thicket, I said. I had watched after the shot. The deer had bucked and disappeared over the ridge, but I had seen small trees and branches shake downhill from where he’d been standing. Wounded deer usually run downhill, if they can, but it was watching the brush that made me confident. The only thing I didn’t know is how far he had run. It turned out that he hadn’t made it out of the thicket. Another friend showed me how to field-dress my first deer. I dressed the next with a torn-out magazine page showing basic instructions. I always had spare latex gloves, which I encouraged the boys to put on and pitch in. I’d at least get them to hold a leg or otherwise stay involved. It’s really pretty simple, I said. You make these cuts and everything on the inside has to come out. If something won’t budge, carefully cut until it comes free. I always noted the entry wound and checked for an exit. If there was no exit, I made a point to retrieve the bullet and show them a CSI-type investigation of internal damage. This is what a bullet can do, I’d say. It was the same with butchering. First they watched, then they helped skin. Now they help with it all, from field to freezer. Today the boys are accomplished hunters, confident in the field, confident hunting on their own, making their own decisions on tracks to follow, approaches to make. And showing them how has made me a better hunter along the way. Each deer season we come away with new experiences, as well as the occasional trophy for the wall, meat for the freezer, and memories that have yet to fade.